In fact, when Johnson and his family first came to Nantucket for a summer visit in 1870, few signs of the island’s prosperous “maritime pursuits” remained. The last whaleship to depart Nantucket’s harbor, the Oak, left in 1869, signaling the demise of the whaling industry, for which the island was known around the world during the eighteenth and early nineteenth centuries. Nantucket’s population, which numbered almost 10,000 in 1840, had declined to just over 4,000 people at the time of Johnson’s first visit. During the first few years of its existence, the society devoted itself to “disprov[ing] the oft-repeated assertion that [Nantucket] is a barren sand heap,” to providing education for island farmers, and to fostering bonds of community so that a new source of economic prosperity and island pride could be found. At the first fair in 1856, high school principal A. B. Whipple explained the importance of those goals, “The great benefit . . . of these fairs, is not all in improved stock, and improved fruits, but in improved minds, improved tastes, improved sensibilities to whatever is beautiful; thereby improving our life and augmenting our happiness.” Through annual fairs, meetings, lectures, and publication of the society’s annual Transactions, the members of the Nantucket Agricultural Society attempted to regain control over their lives by fostering social connections and working together to make it through this dark period of the island’s history. The island’s decline began in the 1840s when the harbor proved too shallow to accommodate the increasing size of whaleships. In 1846, a fire roared through the downtown district, wiping out businesses, homes, and even ships at the wharves. As Nantucket struggled to rebuild, whaleships bypassed the island port for the deeper harbor of New Bedford, which also had access to mainland railroads. In 1849, the discovery of gold in California proved too strong a magnet for hundreds of unemployed islanders, as they left Nantucket, often on ships previously used as whalers, to try their luck out west. And, in the 1850s, the refining of kerosene, which was easily extracted from the earth, provided a cheaper substitute for whale oil. Our great staple, oil, is sliding away from us at a very rapid pace . . . I am led to believe that we have but the alternative to embark in agriculture or the mechanic arts, or embark for a less congenial home than the one which we now enjoy on our native island. Farmers, manufacturers and merchants, does it not arouse you to adopt some decided course of action, or will you wait for the better times that will never come, unless you improve the resources which you have within yourselves. Gardner and the other founders of the society did not have to look far for inspiration. The original group of European settlers, who arrived on Nantucket in 1659 from the Merrimack Valley and from whom several society members were descended, expected to farm the land, much as they had on the mainland. 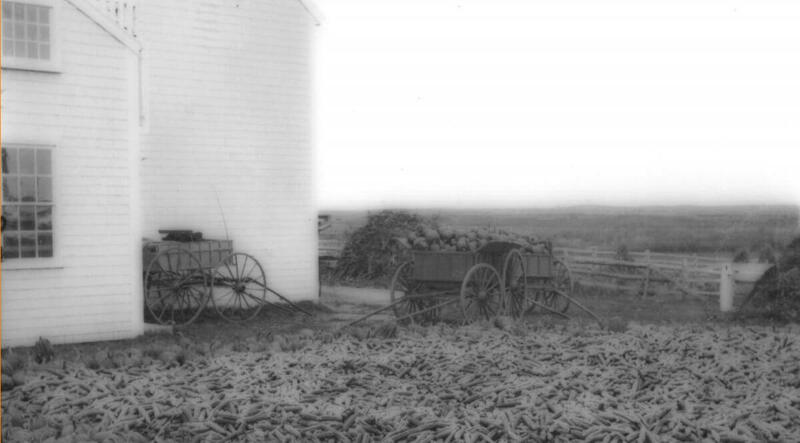 However, the island’s sandy soil was easily depleted and “would not rate above a middling quality,” so the original settlers quickly turned their attention to raising livestock. By 1704, several years before the first sperm whale was captured by a Nantucketer, the New England surveyor of customs listed Nantucket as one of the chief sheep-raising districts in the colonies. With almost 15,000 sheep inhabiting the island by the late eighteenth century, shearing them in the spring was an enormous task, so islanders made it an annual celebration. 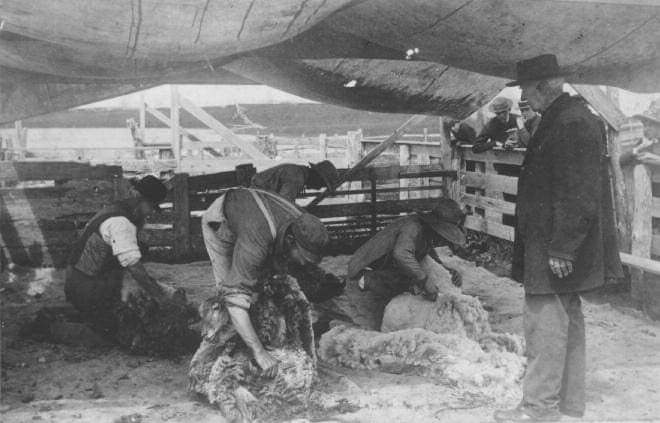 The three-day “Shearing Festival,” described as a “prolonged picnic,” allowed Nantucketers to accomplish a practical task while enjoying one another’s company complete with food, drink, and entertainment. P10170 Sheep shearing c. 1880s. The initial step for the fledgling organization was to raise the $1,000 of capital stock required by the State Board of Agriculture in order to receive its support, including $200 annually for premiums, as the prizes were called. Donations from the society’s officers comprised most of this amount, but membership dues also helped. According to the bylaws, “any person, by paying into the Treasury two dollars (or if a female one dollar), and signing the rules adopted by the Society, shall be considered a member.” To provide added incentive for membership, the society permitted premiums to be disbursed only to those who were members. 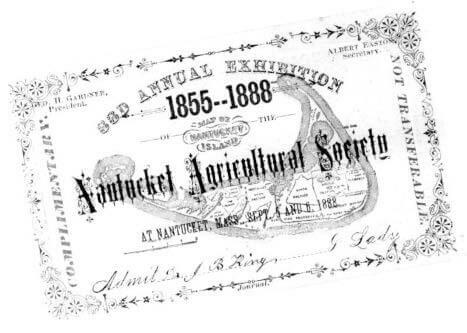 By August 1856, the capital stock had reached $1,000, and the date of October 28 was set for the Nantucket Agricultural Society’s first Cattle Show and Fair. Next week comes the annual Agricultural Fair when everybody will be alive for a short time and a few half starved cows and oxen will be exhibited upon the new grounds recently purchased and fitted for the occasion. I suppose the grounds are really very handsome and if we could look forward to a host of visitors at that time there would be some encouragement for such an undertaking but everything comes from our own pockets—as one lady said, she sent a cake to a Fair and then went and bought it to help them along. As the letter suggests, the struggle to resuscitate the island’s economy created strong opinions, with sup- porters of the Agricultural Society extolling farming and raising livestock as a way to improve island life, without intervention from the mainland, while also preserving island autonomy and pride. 1859, special trips by steamboats “brought a large number of excursionists from the continent— more visitors from abroad than at a previous exhibition, many more,” according to the island newspaper. Holding the fair at the end of September rather than in mid-October made it more convenient for off- islanders to attend, but it compromised the rationale for holding an agricultural fair: it was before the island’s harvest season. The newspaper glossed over this, reporting, “Owing to the fact that the exhibition was held this year at an earlier day than in former years, the show of Isabella grapes was not so large as usual; still a few lots were well ripened.” More important, the news- paper continued, “the fact of the change of time of holding the Exhibition was not generally known abroad,” and few visitors from the mainland attended the fair that year. By 1890, the island had become an active summer haven for artists, due to the abundance of its subject matter and its pleasant climate. Categories for art, needlework, and “mechanical arts,” like woodcarving and printing, were part of the society’s premium list from the beginning of the society. 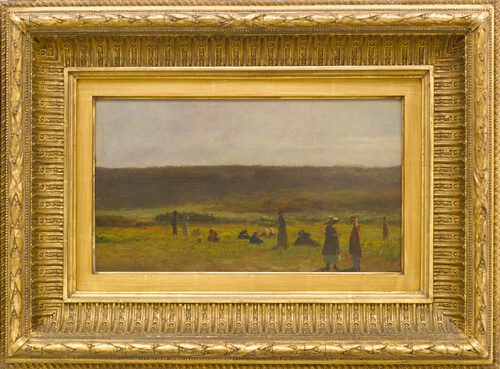 The most renowned American artist to work on Nantucket, Eastman Johnson, did not enter his work in the fairs. However, given the inspiration that island agricultural pursuits provided for him, it seems likely that he attended the fairs when he was in residence. A number of local artists did enter their work, Wendall Macy and James Walter Folger being especially successful in winning premiums. Folger was a native Nantucketer. Trained as a woodcarver in Boston, he dabbled in many media, eventually favoring oil and watercolor paintings and painted woodcarvings. Macy was born in New Bedford to parents who had left their native Nantucket in the 1840s for the better economic climate of the mainland port. Macy lived in New Bedford until returning to Nantucket in the mid-1870s, when his name appears almost immediately in the records of the Agricultural Society, winning premiums and serving on the fair’s organizing committee. 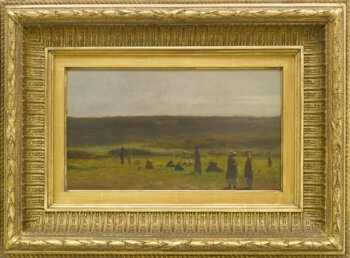 According to an 1877 newspaper account, “Wendall Macy had a variety of paintings from his studio, some of which possessed great merit, and all of which were real- ly beautiful. His painting of taking kelp from the sea- shore, was true to life.” In contrast to Macy’s polished canvases showcasing the island’s natural beauty and to Johnson’s romanticized vision of Nantucket agriculture, Folger’s naïve canvases depict a realistic view of island farming. His paintings show island farms as they were, slightly ramshackle buildings bounded by asymmetrical fences in an uncompromising landscape. As more and more island residents catered to the tourist trade, those charming farms would fall further into decay. In 1876, the Agricultural Society again changed the date of the annual fair, moving it up to the first week of September. However, many island farmers, listed as premium winners and judges in multiple categories for years, simply could not afford to be away from their farms at that crucial time. Diaries kept by farmers who faithfully recorded their attendance at the fairs of the 1860s and the 1870s show only spotty attendance at fair days in the 1880s. Ironically, the society was alienating the very people it was formed to help. Or, perhaps, the society so successfully accomplished its goals that the farmers were more interested in raising good crops and profitable livestock than in participating in the fair. On the contrary, the change of date to early September would be the beginning of the end for the Agricultural Society and its annual fairs. By the late 1870s, tourism was proving a much more satisfactory solution to the island’s economic problems than was agriculture. Nantucket’s lack of a viable industry during the middle decades of the nineteenth century preserved a quaint atmosphere, which appealed to urban Americans who watched the industrial revolution of the late nineteenth century indelibly mark their once familiar landscapes. A visit to Nantucket was an antidote to the effects of the industrial revolution that were then becoming commonplace throughout the northeastern United States. Attending an agricultural fair fit with what the “strangers” came to bucolic Nantucket to experience. It is greatly to be regretted that the interest once taken in the [Agricultural] society has from some cause greatly diminished of late years [I]t is probable that one of the chief causes of lack of interest is, that the annual fairs are held too early in the season of late years the annual fair has been held immediately after the close of a long and exciting summer season; and before the townspeople generally have had time to think of a fair, it is upon them. Aimee E. Newell is curator of textiles and fine arts at Old Sturbridge Village and a free-lance writer. She was formerly the curator of collections at the Nantucket Historical Association. She has published in Piecework Magazine, The Catalogue of Antiques and Fine Art, Nantucket Magazine, Times of the Islands Magazine, Home and Garden Nantucket, and the Dublin Seminars for New England Folklife Proceedings. This paper draws extensively from the manuscript collections at the NHA Research Library, especially the Nantucket Agricultural Society collection, and microfilm copies of the nineteenth-century island news- papers. Additional material comes from letters and diaries written by Nantucketers and artifacts related to the island’s agricultural fairs in the NHA collection.